Maria Kitt is a corporate tax partner at Tax Insight UK and has advised companies on R&D tax reliefs since the legislation was first introduced in 2000. Previously she was a corporation tax specialist in HMRC, with extensive experience of the HMRC R&D units. She has filed R&D claims on behalf of innovative companies from a wide variety of industries and circumstances. 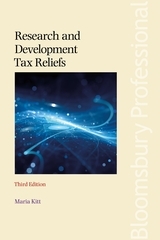 Maria is well known in R&D circles, lecturing and publishing numerous articles on the subject, as well as broader aspects of corporation tax, over a lengthy period.